before they make a move to try and catch him, he runs off down towards the lake. Officer: Usual day's guard duty, no special visitors are expected. Keep an eye open for Larry the Llama, he is apparently back in the palace grounds somewhere, if you see him inform the officer of the watch; they are still trying to re-capture him and get him back into the King's menagerie. General: We are here at Kleinhaus, we control the road from Hausdorf , ready to block any move by the Wittenberg forces to move on Vanderhof. Count Pottsendorf with our allies is at Rottenhausen, we have a small force at Vanderhof. What should our next move be ? Any comments ? Stilltwitz: Get back over the river Oudear as soon a possible I say, let's get home in one piece. General: It is an option, but our orders are to hold Vanderhof until told otherwise. I'm still awaiting a response for my last request to withdraw. Von Rappnov: We have a report from Pottsendorf at Rottenhausen, the vanguard of the Wittenland division is probing his position. General: Haufmann can you see anything down the road at Einhaus ? Haufmann: Yes, some officer wearing a cuirass, some hussars in red uniforms and what looks like jagers in the wooded area. General: It's that damnable Wittenberger - General Waldebeck. Red hussars you say - the only unit I know they have like that is from the Wittenberg Guard Corps. It could be a bluff. Von Rappnov get the army ready and form up assuming we are facing an attack coming down the road from Hausdorf. Haufmann send a message to Pottsendorf - tell him of our situation; he is to fall back to Oberstein. I wish I knew where the main body of the Wittenberg army was ?? The Wittenberg army had been manouvering; the Guard Corps was slowly moving down the road from Hausdorf towards Vanderhof and the Wittenland corps was moving on Rottenhuasen. 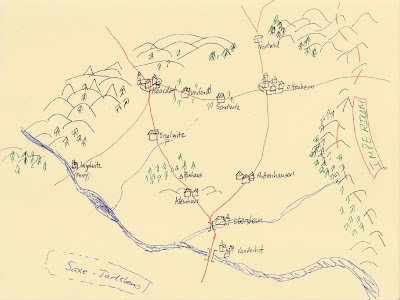 The Field Marshall's plan was in motion; pin the Monrovians down and cross the river into Saxe-Jarlsberg, get behind them and block their river crossing point at Vanderhof. The Boldovian Corps and Household Troops was moving to Ingelwitz - there they would cross the River Oudear. The ramp at one side is completed, as more jagers are ferried across ..
Just in time too, the Wittenland fusiliers cross over .. The vanguard of the Wittenberg army forms up on the other side of the river, it won't be long before the main body arrives. After a long march the River Marines have arrived at their base of operations. With them in the column are a company of engineers and some camp followers. The Wittenberg engineer corp has complered the wharf near Fort Leopold and are just finishing off their work. An engineer watches as one of the river marine's boats gets ready to tie up at the wharf. I made four 9" sections of wharf, they can be turned round and used for field works so they are doubly useful. 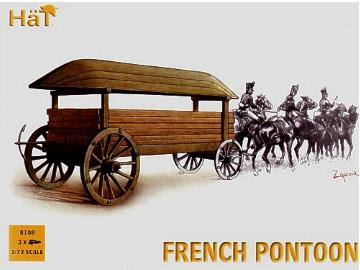 This looks like a useful little set; I understand that it contains 3 pontoon wagons with pontoon and bridges sections - although doesn't come with the front wheelset and horses; presumably you have to buy the French gun limber set as well. I might buy one (?) to see if any bits are useful, as I'm currently gearing up to do my large pontoon bridge and my pontooniers.